After a successful crowdfunding campaign that raised $250,000 and a first-generation product that promised remote viewing of anyone coming to your front door over your home network, Doorbot is rebranding as Ring, and introduced redesigned hardware with more of a focus on home security, and a design that should help it better fit in with its surroundings and compliment existing house design choices. 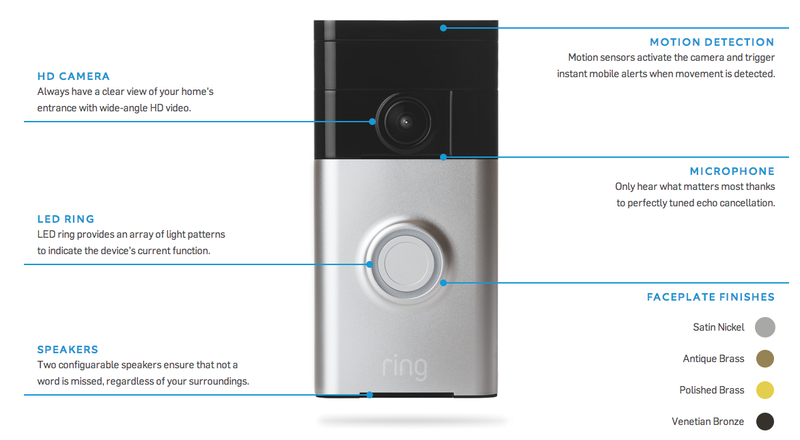 Ring founder and CEO Jamie Siminoff admits that while Doorbot was mostly a success, it was also very much a first-generation product, complete with its own flaws and shortcomings, the feedback from which went into informing the design of Ring. Ring as a brand is designed to encompass more than just a telepresence solution for your front door; the intent was to create a company image that could apply to total home security, with a view to the future and connected home treatment of home protection. Ring can alert users to motion as soon as it’s detected, in addition to recording video, alerting users to any potential crime before it even happens. Often this means they can remotely “answer” the door even if they’re on the other side of the world, which can be enough to prevent something before it’s even happened. Two-way communication on the device works like a phone call, instead of the push-to-talk features of the Doorbot, which makes it easier to communicate with whoever’s at the door, and wide-angle video is also recorded to the cloud in HD resolution. Whereas Doorbot was designed primarily as a doorbell, Ring is conceived of as a security measure first, and Siminoff admits that in addition to its functional evolution, the hardware has also gotten much better in terms of design. Siminoff says that regardless of whether a gadget they’re creating is something that Apple is also currently selling, it behooves any hardware maker out there to compare themselves to Cupertino, because that’s what years of iPhone sales have done to consumer expectations. Even Apple, to some extent, is battling with its own good reputation, Siminoff points out, and general consumers now expect that level of quality and design from all their various electronic devices. But the main selling point, Siminoff says, will still be its role in adding another layer to a sense of security. That’s because it fits into a role where a large portion of daytime crime is happening anyway. With Doorbot, the startup was hearing from customers that they would talk to people at the front door they’d describe as “sketchy,” and these people would think they were home (even if they were communicating via the Doorbot app remotely) and then leave. This led to a shift in focus, whereby Ring would become the ambassador and guardian o the key front entryway, in addition to providing convenience around sending away visitors you aren’t interested in speaking to and communicating with delivery personnel. Ring is available for pre-order now, for $199 until November 1st, at which time it goes back to the full price of $249. It comes in four different finishes, and free cloud-based video recording until January 1, 2015, at which time subscription options will be available. The device works with both iOS and Android, connects via Wi-Fi and is weather sealed. It can record 720p video at 30fps, has infrared LEDs for nighttime recording and features a 5,200mAh rechargeable battery (so it doesn’t require power, but it does require charging). Orders start shipping on November 3rd to early pre-order customers. I asked Siminoff if he sees any immediate threat from the Dropcam-owned Google, or other competitors, and he says that he definitely sees them heading in this direction, but believes they’ve got enough of a head start and experience in this category to prevail. My main interest in a device like this is still making sure the UPS guy doesn’t immediately bolt after ringing the doorbell, but home security and a new, more professional look could help Ring become a standard fixture in a lot more modern homes.